We are still getting used to the tax changes for 2007 with regards to Capital Gain Tax. In this year, both residents and non-residents paid 18%. Previously non residents paid at 35% and residents paid at 15%. Now we have to get used to some more changes. On January 1, 2010, Spain raised its capital gains tax from 18% to 19% on profits up to 6.000 Euros made in one year. The rate now jumps to 21% on profits over 6.000 euros. However, as of June, 2010, the tax increase is frozen at 19% for non-resident property sellers, meaning they pay only 1% extra tax instead of 3%. Most observers feel that this is an error on the part of the lawmakers which will be corrected in the near future. 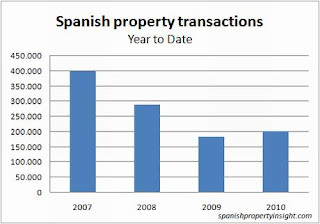 Spain's ITP, the tax charged on private re-sales of property between individuals, also rises from 7% to 8% on transactions over 400.000 Euros. This leaves out the majority of private sales in today's property market. This property transfer tax is paid by the buyer. It was manifestly unfair that residents paid only 15% capital gains tax while non residents paid 35% up to 2007, especially when the non-resident sellers were EU citizens.European Court of Justice has ruled that non-resident sellers all the way back to 1997 can claim a refund. The ECJ over-ruled Spain's claim to a four-year statute of limitation of the claims. Is the Costa del Sol property market still falling? Interestingly, figures from Real Estate Registration Statistics show a light at the end of the tunnel, at last! With everyone having their own opinion on the goings on of the Spanish property market it is difficult to distinguish fact from hearsay. It all depends on whom you are speaking to. We all know that it hasn’t been a walk in the park, and that it seemed that the Costa del Sol’s bubble had burst with far more properties than purchasers. However good news does lie ahead, comparing the sales in the last quarter of 2009 to the first quarter of 2010, we can see that re-sales have increased by 16.95% and off-plan sales have increased by 15.66%. This number of property sales is the highest it has been in the last year and a half. However these figures are not reflective of annual percentages as the property market in Spain is seasonal. If we take into consideration the seasonal fluctuations and average it out across the year we can see that the rate of increase of housing purchases amounts to 1.83% in the first quarter of 2010. This may seem like a small increase but this is the first positive growth after 15 quarters of decline. A direct comparison between the 1st quarters of 2009 and 2010 shows a more favourable annual growth rate of 7.04% - resale properties are the main contributor to this growth rate with an increase of 21.90% of sales, whereas the sale of off-plan properties presents a decline of -3,97%. Whether this recovery of the real estate market is structural or circumstantial can only be determined once the results of at least one more quarter is published, as both circumstantial factors (e.g. the expected increase in VAT rate) and structural factors (e.g. progressive price reductions) can be identified. The results of coming quarters will allow us to make this determination.